The July 2017 Greater Atlanta Coin Show enjoyed a busy, busy, busy bourse filled with dealers and lots of visitors viewing, buying and selling among the showcases of numismatics and other collectibles. Outside, the weather provided a nice day with temperatures in the upper 80s under partly cloudy skies. Inside, the coin show welcomed both new and returning visitors, some selling and some buying. The coin show also welcomed our regular dealers and a few visiting dealers filling in for dealers with schedule conflicts. We appreciate all of the people - visitors, dealers, security and hotel staff - for making the show a busy and fun place to be. Of course, with the metals' prices down, people came looking for bullion such as 10-ounce silver bars and 1-ounce of gold. But, that's not all people came to see. The dealers offer a wide variety of collectibles from ancient to colonial to modern day, foreign and domestic, metal and paper, highly valuable and modestly priced items. The coin show's bourse always includes a wide variety of numismatic and collectible items. Some are modern, some are old, some are expensive, some are modest in price, but all of them are interesting in one way or another. Next month, the dealers will once again pack the bourse with their showcases filled with numismatic and collectible items, some of which will be newly acquired while others will be more familiar. Join us on Sunday, August 13, 2017, at the next Greater Atlanta Coin Show to view, buy, sell or trade with the dealers among their many displays. This month, let's take a look at some fun, and maybe a little bit out of the ordinary, items on the bourse. "1958 Proof Sets are a collector's favorite with the end of the Wheat Cent reverse and the dawn of the Memorial Cent reverse. The 1958 Proof Set is difficult to obtain. "1958 Proof Coins are found with Brilliant, Cameo and Deep Cameo surfaces. Brilliant Proofs are the most common, Cameo Proofs of any denomination are scarce, but Deep Cameo Proofs remain very rare. 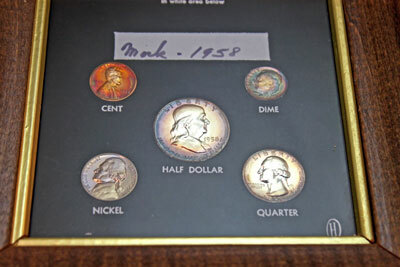 Rather than original US Mint packaging, this 1958 proof set commemorated "Mark's" birth in 1958. The background provided a place for Mark's baby picture, but it doesn't appear to have been included. Many collectors, however, find the additional toning to be highly attractive. Just look, each of the five coins have blue, red and purple toning in addition to their original silver, nickel and copper colors. In their book, Mr. Gale and Mr. Guth included examples of toned coins, one of which was a 1958 half dollar. This birth set has a prettier one with its edge toning seeming to highlight Dr. Franklin's portrait. Today, this year set is not an expensive collectible, however it does have worth due to its age and to its silver content. In the middle of the1982 production, the US Mint changed their one cent coin blanks to be mostly zinc with a small amount of copper. In addition to the metal content change, the US Mint struck large date and small date varieties. The copper varieties include Philadelphia large date and small date, Denver large date and the proof San Francisco coins. After changing to zinc, the varieties included Philadelphia large and small dates and Denver large and small dates. From the introduction of the small cent in 1856 to today's one cent coin, the diameter has remained the same at 19mm. However, the weight of the small cent changed as its metal content changed. Initially, the coin weighed 4.67 grams then 3.11 grams and now 2.5 grams. For the 1982 varieties, of which the quantities by variety are unknown, a simple weight comparison can determine whether the coin is primarily copper or primarily zinc. As for the large date versus small date, you can magnify and compare the coin's date to the examples found on the PCGS CoinFacts web page. 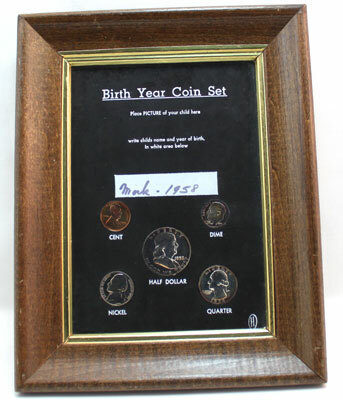 Next on our display is a set of the 1982 Lincoln Cent varieties of the business strike. This example set did not include the proof strike from the San Francisco mint. Prior to 1982, the Lincoln one cent coins consisted primarily of copper with small amounts of zinc and tin. It would be a rare coin show not to have silver eagles on display. 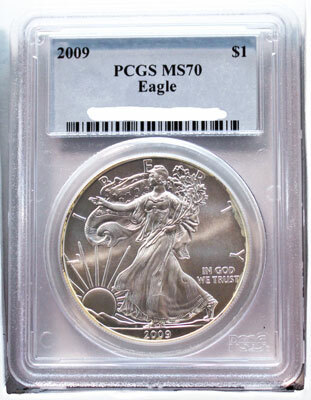 This month, let's look at a 2009 PCGS MS-70 version. Per the ANA Grading Guide, an MS-70 coin is the "perfect coin." "Has very attractive sharp strike and original luster of the highest quality for the date and mint. No contact marks are visible under magnification. There are no noticeable hairlines, scuff marks or defects. Eye appeal is attractive and outstanding." 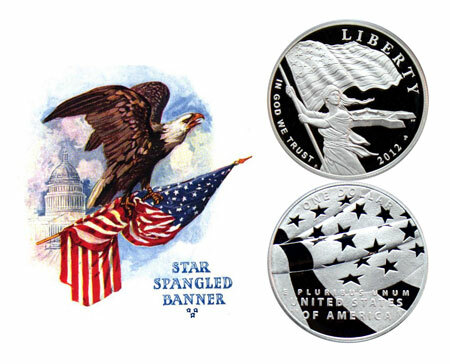 Also interesting, the US Mint chose not to produce any proof versions of the 2009 American Silver Eagle coins. But, of the over 30 million they did produce, PCGS estimates greater than 41,100 to be "perfect coins" or MS-70 grades. Not a low mintage rarity, but a beautiful, "perfect" coin nonetheless. 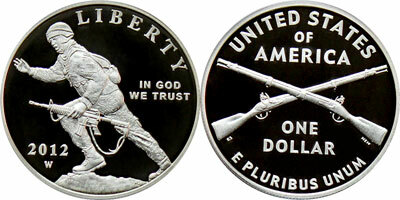 Legislation approved October 8, 2008, titled the ‘National Infantry Museum and Soldier Center Commemorative Coin Act’ specified the coin now known as the Infantry Soldier Commemorative Silver Dollar. "The Secretary of the Treasury (hereafter in this Act referred to as the ‘‘Secretary’’) shall mint and issue not more than 350,000 $1 coins in commemoration of the legacy of the United State Army Infantry and the establishment of the National Infantry Museum and Soldier Center. "In general, the design of the coins minted under this Act shall be emblematic of the courage, pride, sacrifice, sense of duty, and history of the United States Infantry. "All sales of coins issued under this Act shall include a surcharge of $10 per coin. "Subject to section 5134(f) of title 31, United States Code, all surcharges received by the Secretary from the sale of coins issued under this Act shall be paid to the National Infantry Foundation for the purpose of establishing an endowment to support the maintenance of the National Infantry Museum and Soldier Center following its completion." The coins released in 2012 could be sold by the US Mint through December of that year up to 350,000 coins. Five years later, the production levels reported in the Red Book show the West Point mint struck 44,358 of the regular versions and 161,151 proof versions. 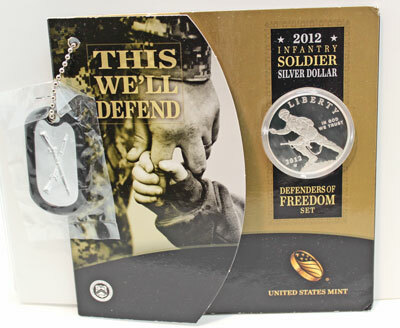 This simple yet powerful set provides a fitting tribute to the many past, present and future soldiers defending Liberty. "(1) During the Battle for Baltimore of the War of 1812, Francis Scott Key visited the British fleet in the Chesapeake Bay on September 7, 1814, to secure the release of Dr. William Beanes, who had been captured after the British burned Washington, DC. The next and last coin on the tour this month is another 2012 commemorative silver dollar coin. The 2012 Star-Spangled Banner Commemorative coins honored the 200th anniversary of the War of 1812 and Francis Scott Key's memorable poem. This legislation allowed for no more than 100,000 gold five-dollar and no more than 500,000 silver dollar commemorative coins. Congress also specified for the design: "The design of the coins minted under this Act shall be emblematic of the War of 1812 and particularly the Battle for Baltimore that formed the basis for the Star-Spangled Banner." The coins included surcharges of $35 for the gold and $5 for the silver that "shall be paid to the Maryland War of 1812 Bicentennial Commission for the purpose of supporting bicentennial activities, educational outreach activities (including supporting scholarly research and the development of exhibits), and preservation and improvement activities pertaining to the sites and structures relating to the War of 1812." "(2) The release of Dr. Beanes was secured, but Key and Beanes were held by the British during the shelling of Fort McHenry, one of the forts defending Baltimore. "(3) On the morning of September 14, 1814, after the 25- hour British bombardment of Fort McHenry, Key peered through the clearing smoke to see a 42-foot by 30-foot American flag flying proudly atop the Fort. "(4) He was so inspired to see the enormous flag still flying over the Fort that he began penning a song, which he named The Defence of Fort McHenry, to commemorate the occasion and he included a note that it should be sung to the tune of the popular British melody To Anacreon in Heaven. "(5) In 1916, President Woodrow Wilson ordered that the anthem, which had been popularly renamed the Star-Spangled Banner, be played at military and naval occasions. "(6) On March 3, 1931, President Herbert Hoover signed a resolution of Congress that officially designated the Star-Spangled Banner as the National Anthem of the United States. According to the Red Book, the US Mint actually struck and distributed 41,686 regular and 169,065 proof silver dollar coins and 7,027 regular and 18,313 proof five-dollar coins honoring the Star-Spangled Banner and remembering the War of 1812. 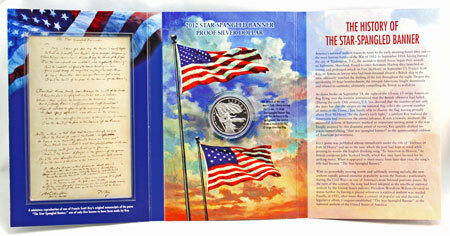 This particular commemorative set provided more of the historical background of Francis Scott Key and the Star-Spangled Banner along with a miniature image of one of Key's original manuscripts of his poem around a proof version of the commemorative silver dollar coin. The set provides history and beauty with the coin showing Liberty waving the 1812 war era's 15 stars and 15 stripes flag with Fort McHenry in the background on the obverse while the reverse shows the modern 50 stars and 13 stripes flag.